The highly anticipated announcement of new iPads came on the heels of compelling alternatives from Windows. Apple took the cover off of two new iPad models at a special launch event in San Francisco last week, unveiling what is sure to be a pair of highly sought slates this holiday season. The new iPad Mini and 5th generation iPad are set to hit store shelves in November, and pack a few new features which should give pause to consumers thinking of swooping up one of the old models on clearance. Both the iPad Mini and the iPad Air (Apple’s new designation for its 10” tablet) will be packing the A7 processor introduced by the iPhone 5S, boasting more power and faster speeds than any previous generation. They will also have an M7 coprocessor, which is used to better collect data accrued by the machines’ motion sensors. The Mini has gotten a sorely needed upgrade in screen resolution. Now equipped with one of Apple’s highly touted retina displays, the 7.9” screen clocks in with a resolution of 2048x1536, giving it 326 pixels per inch and a minor leg up on Google’s Nexus 7 and Amazon’s Kindle Fire HDX. The Air will have the same resolution on its 9.7” display, and both will be able to record video in full 1080p HD, or video chat at 720p through FaceTime. On the physical front, the Air comes with a 43% thinner bevel and 20% thinner body compared with the fourth generation iPad, and it shaves off nearly a third of its older sibling’s weight. At just 1 pound, the Air is light enough to earn its moniker. Both models will be available in a variety of storage options—16GB, 32GB, 64GB, and a new 128GB capacity—as well as WiFi-only and cellular network options. Depending on size and connectivity, the Mini will cost between $399 and $829, and the Air will run from $499 to $929. Apple’s announcement comes shortly after Microsoft began pushing its second iteration of the Surface Windows tablets. 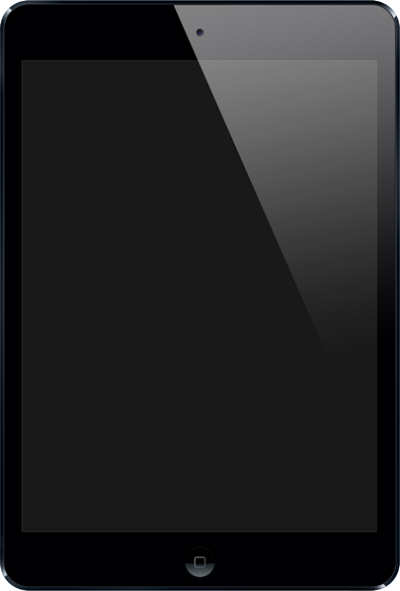 Packing a 10.6” screen with 1920x1080 resolution, the Surface is available in RT (Windows’ slimmed down tablet operating system) and Pro (running full Windows 8.1). The Surface 2 is powered by 2GB of RAM and comes with a choice of 32 or 64GB of storage for $449 or $549. Microsoft’s Surface Pro 2 has several options to consider: 64GB and 128GB models which both have 4GB of RAM, or 256GB and 512GB models with 8GB of RAM for higher storage and faster performance; the Pros range from $899-$1799. All of the new Surfaces have fully functional USB ports, video outputs, and microSD card slots for expandable memory. They will also work with their signature keyboard covers, of which there are now backlit options ideal for typing in the dark, and come equipped with built-in kickstands to further bridge the gap between tablet and laptop. Alongside Microsoft’s self-produced slates, the largest manufacturer of Windows Phone devices announced it would be making a foray into the tablet market. Nokia’s Lumia 2520 will run on Windows RT like the basic Surface, and have a full HD 1080p display on its 10.1” screen. It will be powered by a quad-core processor and 2GB of RAM, and have 32GB of memory with a microSD slot for the option to add more on. Nokia claims the Lumia tablet’s screen has been crafted to provide “the best outdoor readability” of any tablet, so as to make it perfectly usable even in bright natural light, thus enhancing the portable nature of the slate. Like the Surface, there is an optional keyboard cover; in the Lumia 2520’s case it also adds on two usb ports, a trackpad, and a 5 hour boost to battery life. Pricing and availability on the Lumia tablet have not yet been revealed, but it would not be surprising to see it come out before the holidays in order to better compete against the many alternative tablets now available. Subject: LongIsland.com - Your Name sent you Article details of "Apple Launches 2 New iPads; Microsoft Tries to Entice with New Surface"